Rasmieh Odeh's claim that she was abused while in Israeli custody 45 years ago may yet be heard by a federal court in Detroit. The Sixth Circuit Court of Appeals on Thursday remanded her 2014 immigration fraud conviction back to district court to reconsider whether a psychologist's testimony about alleged post-traumatic stress is admissible. Odeh was convicted of bombing a Jerusalem grocery store and a British Consulate building for the Popular Front for the Liberation of Palestine (PFLP) in 1969. The grocery store attack killed Hebrew University students Leon Kanner and Edward Joffe. She was set free after 10 years in a prisoner exchange and made her way to the United States. When she applied for naturalization as a United States citizen in 2004, she claimed she never had been arrested or convicted of a crime. At one point, she claimed she thought the questions only applied to her time in America. The immigration officer who interviewed Odeh testified that, as a rule, she asks applicants whether they ever were arrested or convicted "anywhere in the world." But defense attorneys also argued that she blocked out the Israeli conviction due to the post-traumatic stress caused by alleged torture in Israeli custody. Had she disclosed the arrest and conviction, immigration officials would have rejected Odeh's application to enter the United States and later to become a citizen, witnesses testified during her trial. "We do not address other possible bases for excluding the evidence, under evidentiary standards such as those identified by the district court in its order discussing the use of PTSD testimony in federal and state courts," the Sixth Circuit opinion said. "Nor do we prescribe whether a new trial would be required once the evidentiary determination has been made." The psychologist's testimony "is not categorically barred by our decisions" in other cases, the ruling said. But neither does the opinion guarantee a new trial. Harold Joffe, whose brother Edward died in the grocery store bombing, called the Sixth Circuit opinion "clearly disappointing." Defense attorney Michael Deutsch welcomed the ruling, telling Politico's Josh Gerstein he was "happy and pleased, and it was somewhat what I thought would be the result. If Drain determines the psychologist's testimony is inadmissible on other grounds, the error could be considered harmless and the jury's guilty verdicts would stand. If the testimony now is found to be admissible, Odeh would receive a new trial. "The district court, however, did not rule on the competence or reliability of this testimony," the ruling said. "Indeed, the district court did not tie the exclusion of evidence to a reasonable evidentiary restriction, but to a supposed categorical rule that does not apply." Drain described the verdict as a "fair and reasonable one based on the evidence that came in," and at sentencing, noted that during her own testimony, Odeh repeatedly violated the court's instructions not to discuss her claims of torture. Odeh's torture claim is based solely on her word. Interviews from a 2004 film, "Women in Struggle" showed Odeh and an accomplice casually discussing their involvement in the bombings. A 1993 video, "Tell Your Tale Little Bird" shows an accomplice discussing "the operation on the Supersol" grocery store and saying Odeh participated. The same video shows Odeh admitting, "I was captured" by Israeli authorities afterward. In addition, as Cornell University Law Professor William Jacobson wrote last year, Odeh "confessed the day after arrest" by Israeli officials, before any alleged abuse would have taken place. Odeh's claim is that she broke after 25 days of torture. Despite the inconsistencies in her story, Odeh has been embraced by Palestinian advocates and leftist groups who see her as a hero. Her story is accepted without question, while every piece of evidence provided by Israel is dismissed as fraudulent. The Investigative Project on Terrorism chronicled Odeh's case and the support she received, in a series "Spinning a Terrorist Into a Victim." 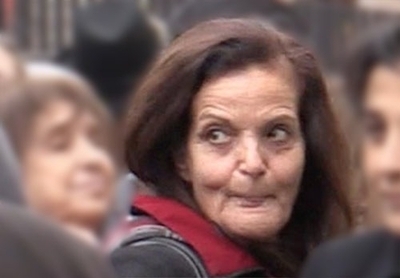 Update: In a statement about the opinion Thursday, Odeh supporters described her as a "legendary Palestinian American icon." The opinion rejected other aspects of Odeh's appeal based on court rulings and whether her sentence was reasonable as "without merit." If the conviction stands, Odeh faces 18 months in federal prison followed by deportation from the United States. Read the full Sixth Circuit opinion here. Rasmieh Odeh is a murderer. She deliberately lied on repeated occasions during her application submission for US citizenship. PTSD is completely irrelevant. Is there any doubt regarding her crime? But that doesn't bother Odeh's supporters. They see this as a golden opportunity to cleanse the Palestinians of their collective guilt for their genocidal actions over the past 70 years and more. Rewriting the narrative. Rewriting the history books. These misguided leftists stop at nothing in their Jihad to delegitimize Israel. This is not about human rights. It's about creating a public opinion that justifies the random killing of Jews and Israelis. Who's paying Odeh's legal fees? Is Odeh the kind of person the United States wants as a citizen? What added value does she bring to the people of the United States? Get on with it and implement her sentence without any further delay. PTSD??? Seriously? This is just as bad as the AFFLUNZIA (sp - how do you spell a non-word) defense.